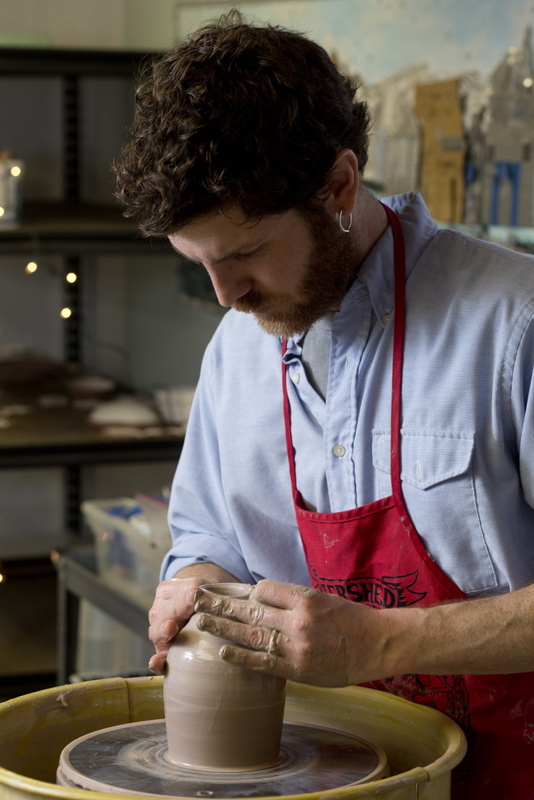 Topsham potter Jeffrey Lipton uses modern designs and old-fashioned methods. He salt-fires his pots (and mugs and bowls and boxes) and, whenever he gets the chance, he also uses a wood-fired kiln, a communal affair that takes about two cords of wood and people with the energy to stoke the fire for 18 hours straight. A graduate of the University of Southern Maine and a yearlong residency at the Watershed Center for the Ceramic Arts in Newcastle, Lipton decorates his work with imagery that pleases him, including tractors or wild-haired farmers toting farm equipment. We called him up to talk about the potter’s life and sourcing clay locally and to find out the bitter truth about selling his beautiful and unusual agriculture-oriented pots. His work is available on Etsy and will be at Stable Gallery’s holiday storefront in Bath. A POT TO LIVE ON? Rudely, we asked Lipton if throwing pots was his day job. He laughed. “My sights are set on that,” he said. “It’s not easy to make a living as a full-time potter.” For now he works on a landscaping crew. “That is good supplemental work,” he said. “It gets me outside all day, working with plants, and that is something I have always had an interest in.” He developed his interest in ceramics while at USM. Before then, “I’d never thrown a pot in my life,” he said. Because of environmental considerations, salt-firing is no longer done industrially, but it’s not a lost art because some potters are so fond of the look it lends their work. THE UPSIDE OF WOOD: The wood-fired kiln comes with a bonus: socializing. “It’s kind of a forced community,” Lipton said. “You rely on other people because it’s a lot of labor.” So it’s like making maple syrup in terms of labor? Yes. Except he could end up with 400 or so mugs, bowls, pots, boxes, etc., from one of those sessions. LOCAL CLAY? While he was at Watershed, Lipton experimented with a mound of clay left over from the former Newcastle brick factory where the arts center is based. He raked and processed it through screens to remove the debris. Most of it. “It is really funky stuff to throw,” he said. “You wound up with pebbles and little bits of grass in your pieces, but it is really beautiful clay.” Nowadays he uses commercial clay. WHAT’S WITH THE FARMERS? Lipton’s parents were back-to-the-landers with big gardens. They canned, they played music, and they passed on a love of that lifestyle to their son. He also worked on Swango Farm in Woolwich for five seasons as a farmhand and a seller at the farm stand. Those two forces showed up in some of his work: tractors, front-end loaders, lady and gentleman farmers holding hoes, rakes and what have you – charming stuff, especially for people with an interest in agriculture. But he’s stopped making it.